We treat all our visitors as friends, in the true spirit of Canadian and Greek hospitality! Dany and I left Canada in 1984 to move to Greece. Dany is from the city of Quebec and I, Ivan, come from Montreal. I was brought up around horses. Most riding in Canada was with Western tack so I worked at the Sans Souci Riding Center to gain experience of the English style of horse riding. 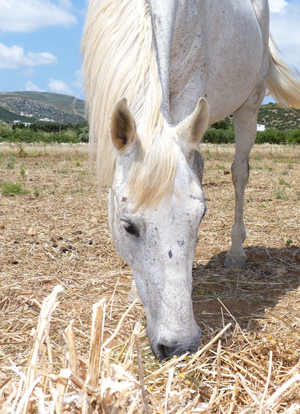 We started Kokou Riding Center on Paros in 1990, with five horses. We now have twenty eight, all strong, sure-footed, and attentive. To maintain quality, we keep the business small. I, Ivan, am the main Guide, and we have well trained interns taking you out on our rides. Dany takes reservations, organises and runs transportation where needed, and provides all the information you may need to find Kokou. 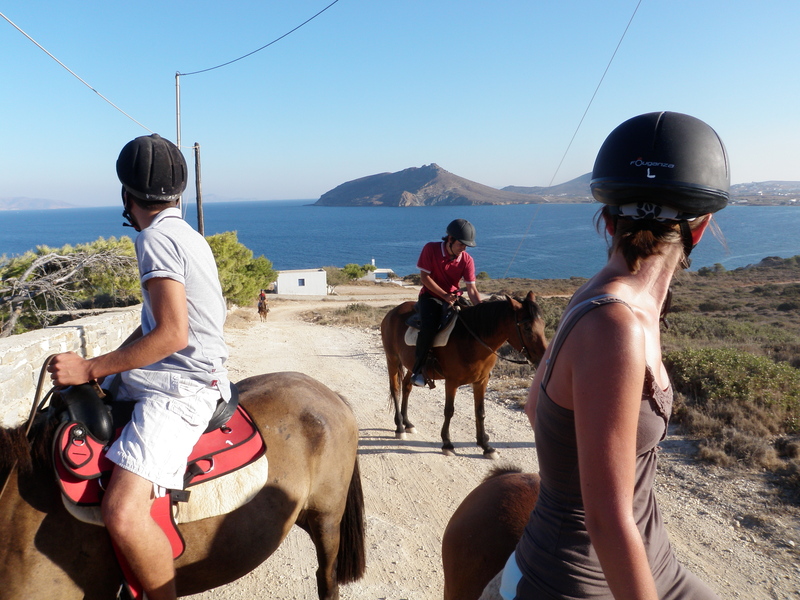 …along with some useful tips on what to do and see on Paros. 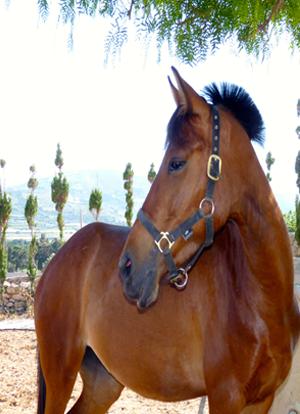 Gentile horse , 6 years old , grand daugther of Zomby so very agile. We treat all our visitors as friends, in the true spirit of Canadian and Greek hospitality! 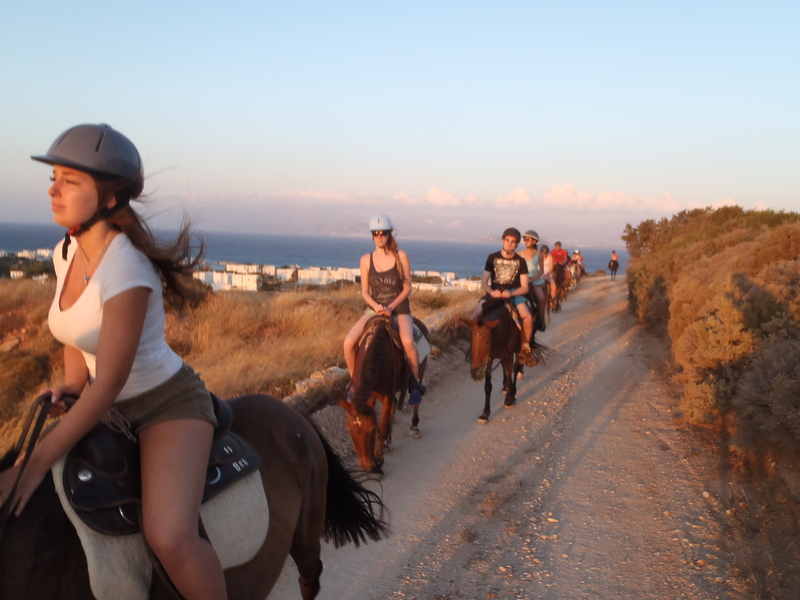 No horse is allowed to pass our Guide, unless the Guide is confident the rider is experienced and safe. Then you may go on freely. 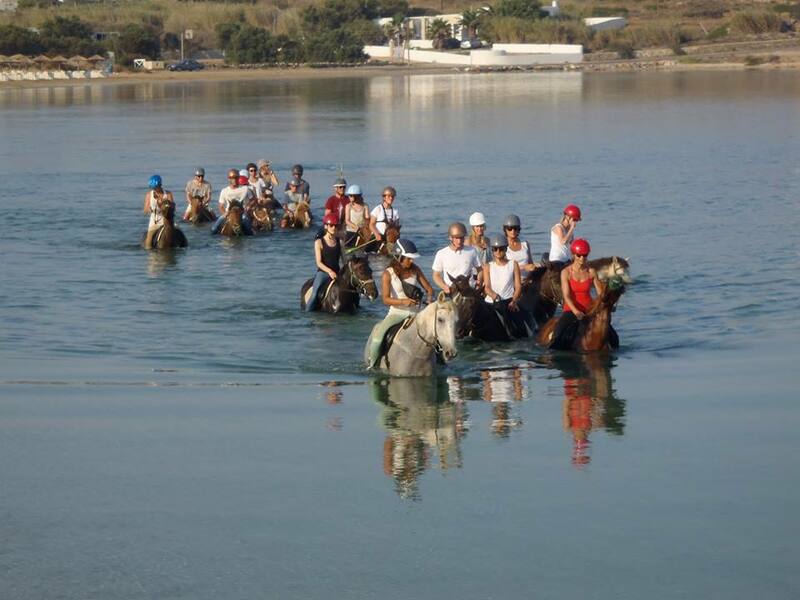 Kokou Riding Center provides set tours, in the morning and in the afternoon in the company of an experienced Guide. We do not provide horses for rent. It is not possible to just turn up and ride, as our horses require to be prepared and saddled up before departure time.Visitors wishing to join a tour require to book in advance. You should arrive at Kokou Riding Center at least 15 minutes before your tour is due to depart. 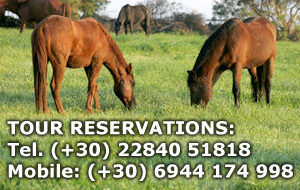 On the few occasions where no reservations have been made for a particular ride, our horses have the opportunity to rest. The Kokou swimming tour lasts around two and a half hours. You should arrive at Kokou Riding Center at least 15 minutes before your tour is due to depart. 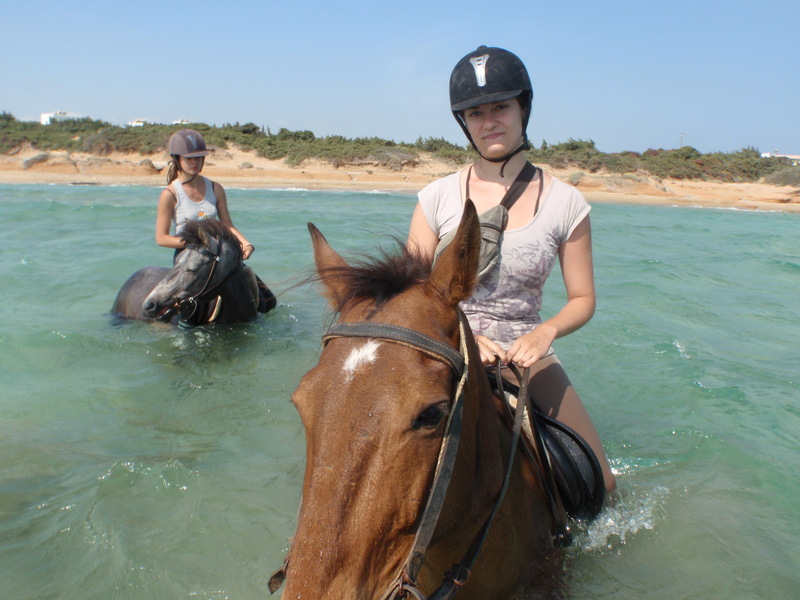 This tour includes a number of local beaches, and riding in the sea. 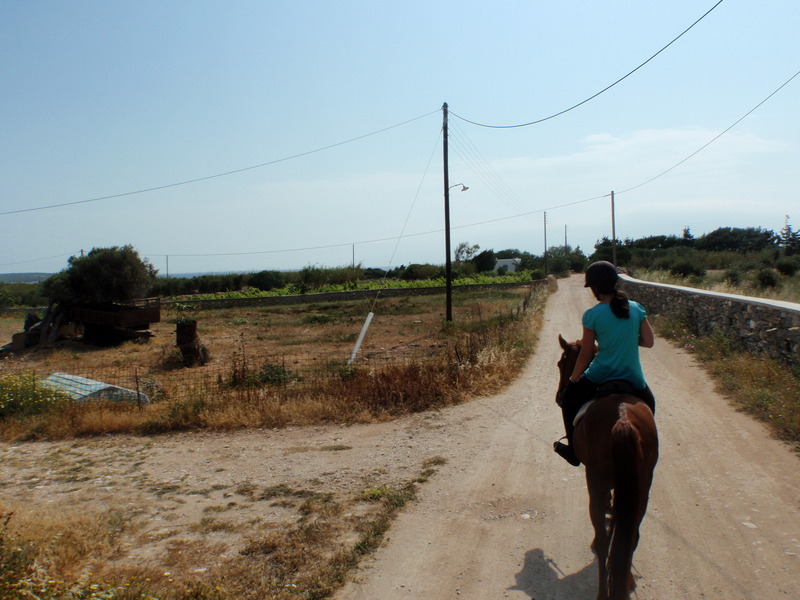 Taking our horses (and our visitors!) into the sea is dependent upon weather and safety, and therefore is not guaranteed. Kokou's coastline tour is shorter, lasting around one and a half hours. We can’t access beaches since they are full of tourist at that time but we do the coastline of Plakotos that is not to be missed. The Kokou morning tour departs between 5.30am – 9.00am depending on the sunrise, and lasts around two and a half hours. 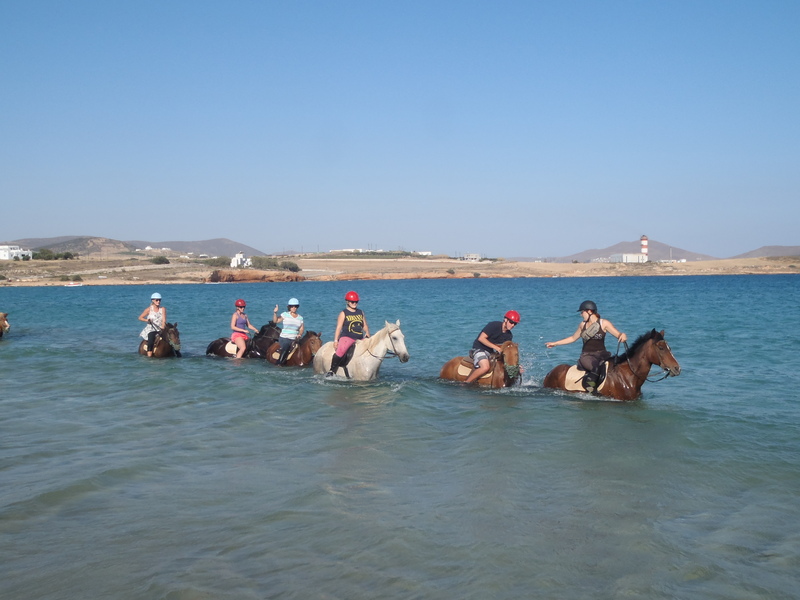 This tour includes a number of local beaches, and swimming in the sea, this is the difference between our two rides, we go in the sea only in the mornings. 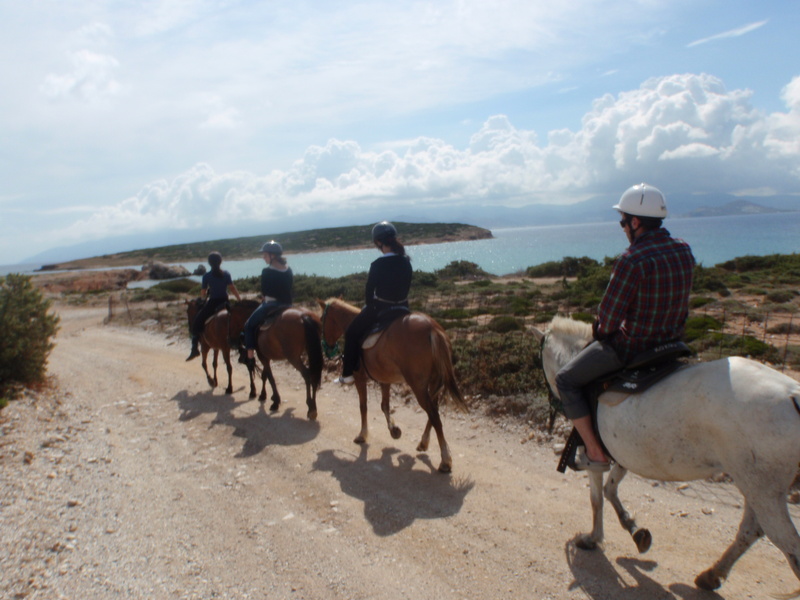 Taking our horses (and our visitors!) into the sea is dependent upon weather and safety, and therefore is not guaranteed. Kokou’s Sunset Tour is shorter, lasting around one and a half hour. 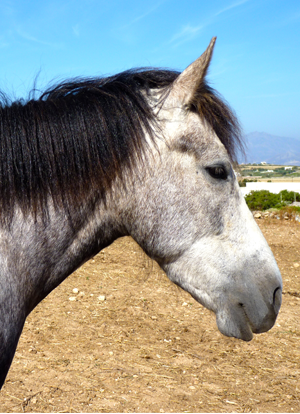 It starts betweent 5.15-6pm, so that neither our visitors nor our horses are cooked by the sun! We can’t access beaches since they are full of tourist at that time but we do the coastline of Plakotos that is not to be missed. 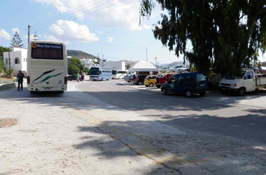 For a small fee of only 5€ per person we can arrange to collect visitors from our pick-up point opposite the bus terminal in Naoussa and return them there after their ride. Please use this form to make a reservation or to make an enquiry. If you have not heard from us within this period, please check your spam filter. To send us your message, please click 'Submit'. Kokou Riding Center is easy to find. 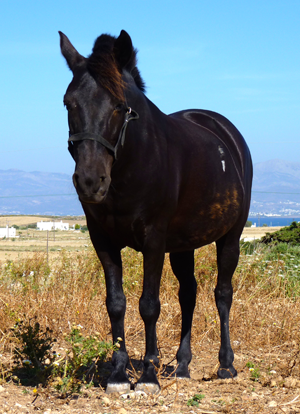 We are located just outside Naoussa, the second town of Paros. 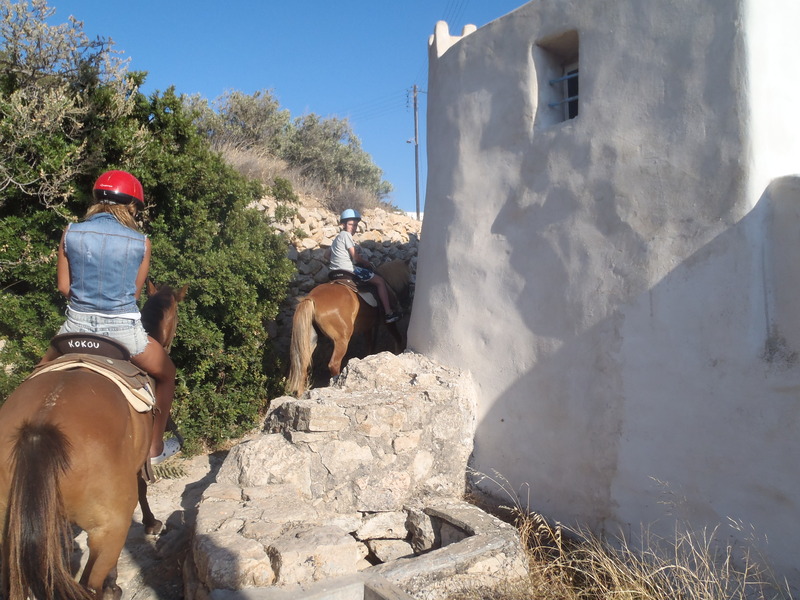 From Naoussa, take the road that is signposted 'Marpissa, Piso Livadi, Pounda, Drios'. After just one kilometre, you will see a Cyclon gas station on your right. Directly opposite the gas station is our road. It is clearly signposted! Follow this track all the way to the end (around 400 metres) and you will find Kokou Riding Center. Use our maps and the photos of our Transportation pick-up point in Naoussa (left and below) to guide you. The kiosk is opposite the bus terminal. 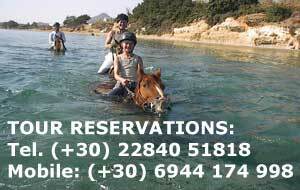 On request, we can offer transportation from Naoussa (3 euros per person round trip). For more informations, please call us at (30) 22840 51818. Look at theses videos on how to come. Paros Island- a beautiful island! Paros Island is simply a typical touristic destination in Greece. Indeed, every year thousands of tourists come and visit this island. Paros is well-known nor only for its friendly welcoming, its night life, its bars and clubs but also for its typical Greek buildings. 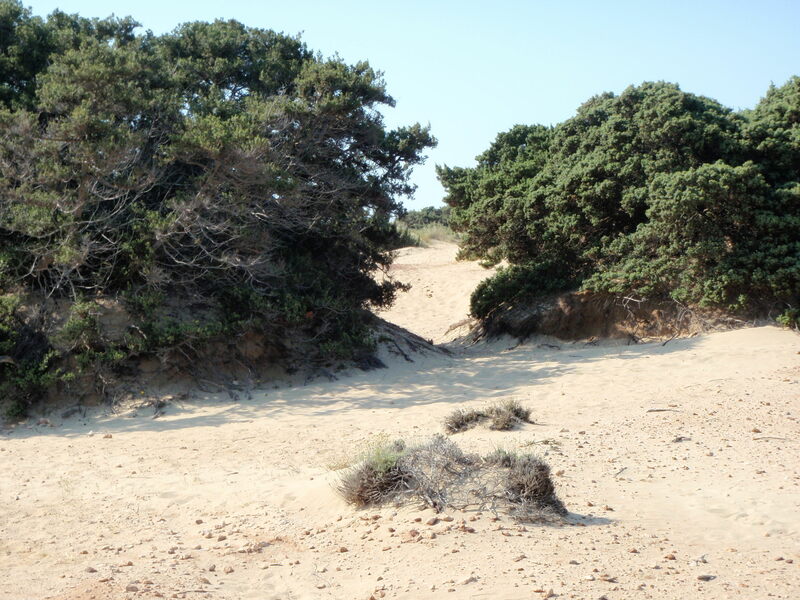 You're going to be seduced by Paros' hills that go until the beach. You're also going to be impressed by its vineyards, its lemon tree and its olive trees. Paros Island means also having a quite walk along its old ports where you can see typical barges and boats. You can also walk along little streets with a huge range of white walls and typical flowers. Enjoy your stay in Greece and discover its Mediterranean food with spices, oil, and vegetables.